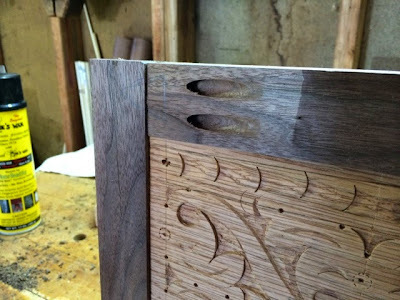 A while back I carved a long panel with "S" scrolls. I didn't know what to do with it per say. So I simply hauled it around to my carving demos as an example. Recently someone who I hope will turn into a benefactor and long term client expressed interest in owning the panel after I "finished it up a bit". I will be seeing them again at the end of this month and I thought I'd make a simple walnut frame and a little natural Danish oil to "finish" it. I built most of the frame yesterday and decided to join it with pocket screws today. Everything was going swimmingly until I went to attach the last side. I drilled the damn holes on the wrong side of the frame. In one corner. Bonehead rookie mistake. All I could do was laugh at myself. And I don't think I have any more of this thicker walnut stock left. I can't hide these holes with plugs. That'd look like hammered crap. Guess it's back to the drawing board for a while. As my father-in-law would say... the "Stupid Tax". I have paid that tax soooo many times. I'm not sure where you are with this project, but may I suggest hiding the pocketholes behind a (double) inlayed banding in a contrasting wood (such as sycamore or other pale creamy white wood) that runs all the way around the frame. Alternatively you could do any number of different inlaid bandings, but all would hide the mistake and add detail to the frame.